Join me to learn how to use the tools you see on the wall! The Fall 2015 session of my Popular Woodworking University "Intro To Hand Tools" course is now open for registration here. The course consists entirely of online videos you can watch on your own schedule, running October 21 through January 21. Cost is $59.99. This is over 12 hours of instruction in 7 major parts. You can find a complete episode guide here to see what's covered, as well as links to a free sample lesson, trailer video, and tool list. 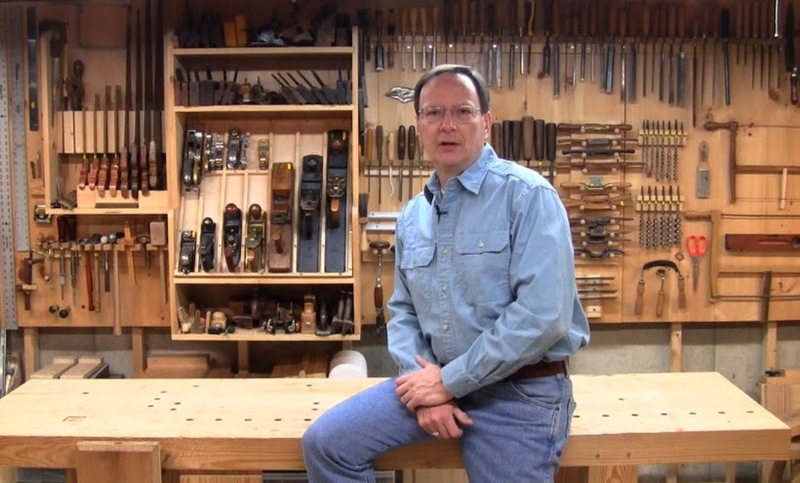 Whether you want to learn to do everything with hand tools, or just want to add some hand skills to your power tool workshop, you can find it here. Why do everything with hand tools? The main reason is that not everyone has space or money for a power tool workshop. Hand tools allow you to work in the tiniest space, quietly so you don't disturb your family or your neighbors, starting with a modest investment. "Great course. Although I don't own a number of the tools demonstrated, it still shows the proper techniques if I ever do obtain them. Also shows how to properly use the ones I do own." "This was some of the best time I've spent on woodworking instruction. Lessons were clean and well paced. Mistakes and pitfalls were addressed with fixes. It was great to see the operations performed with the "why" narration in the background. If this becomes (or is) available on DVD, it will be added to my library. Thanks Steve....."
"Great course, got me back into woodworking quickly and efficiently. Much better than searching YouTube for videos on similar subjects. Quality of video, editing, and audio was great, as well as the logical approach taken by the instructor." "Thank you so much for this opportunity in learning the crafting skills of woodworking. Steve offers his skills, techniques and insights on how to achieve the in product. Excellent job Steve!" Thank you! As noted in that first comment, one of my goals is to provide a thorough introduction with a broad range of coverage. I want to be sure to cover not just the tools you have now, but the ones you might run into in the future. Will I be able to keep/download the videos, or have unlimited access to them ? Or is it all ending December 21st ? I tend to forget things fast and having them on hand would help. Or maybe are you planning on releasing a DVD at some point ? Hi Remi, someone else had made a similar inquiry, so I checked with Popular Woodworking. They provide permanent read-only access to their courses after they end, so you can rewatch the videos at any time. You just can't ask questions or use the discussions after the end date. I'll update my blog entries to make that clear. Thanks for the reply ! I received an answer from FW media today concerning this question, and they basically said the same as you, but it seems that the courses videos are available for a limited time only after the class is over. They didn't specified for how long howerver..
Hi Remi, I double checked with the course manager, and they are indeed permanently available after course end. That's a fairly new policy, so he'll make sure all the customer service folks are aware of it.